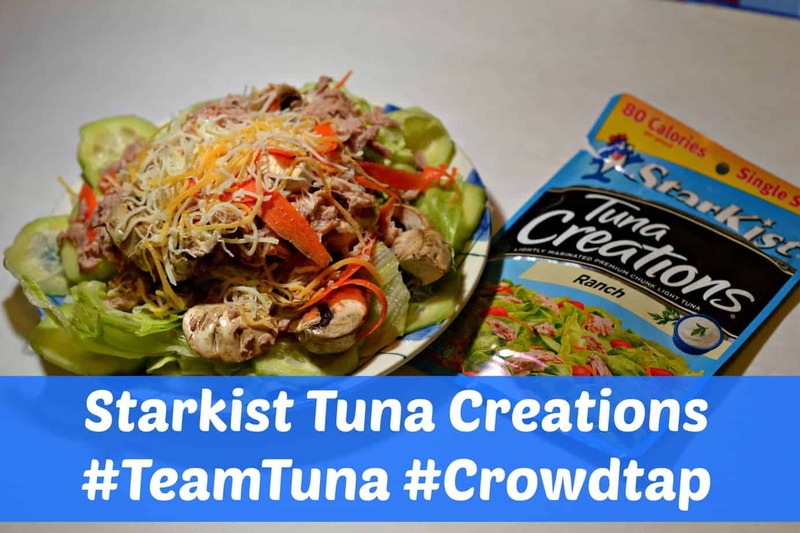 I am a member of Crowdtap and I was sent Starkist Tuna Creations in exchange for an honest review. First off, I’m not the tuna person in the house. Mr. Houseful is, and when he saw the packet, he wouldn’t touch it because it stated that it was Ranch flavored. Scaredy cat! I was all for it, because I love most things ranch. I was hopeful that this packet of Starkist Tuna Creations would make Mr. Houseful very sorry that he ever turned his nose up at it. However, I did salvage it, and ended up enjoying it the way that I made it – which is pictured above. Single serve packet, makes individual preparation a breeze! The liquid has already been drained, so you don’t have to worry about that aspect either. Fits easily into a purse, backpack, lunchbox, etc. Contains enough protein to power you through the rest of your work or school day. The taste right out of the package. However, let me be fair, I don’t really like ANY tuna straight out of the package, and this was no exception, however, the ranch flavor that they added, just made it a bit more, interesting. So, because I couldn’t take the taste right out of the package, I decided to do what I always do with things that I’m not particularly fond of, but know it’s good for me. I made it into a salad. I added mushrooms, regular lettuce (although I would have preferred spinach) cucumbers, shredded carrots, and cheese, and a teensy bit of ranch dressing to actually bring out the ranch flavor, and we had a WINNA! The Starkist Tuna Creations also come in Lemon Pepper and Sweet & Spicy flavors and only boast 80-90 calories per serving. Honestly, I would purchase more of these to get me through those long days as CEO of Houseful of Nicholes and Stitches, but I’d probably make sure that I had back up condiments to make sure that I liked what I was eating, so I guess that makes me #TeamTuna. So if I had to rate it, it would be a 3 out 5 stars because their convenience, and non-messiness factor overcomes the taste issue, especially, since you can ADD things to it to make it tastier. However, if you forget those…I feel sorry for ya motha’.